Ed was born in Dayton at Good Samaritan Hospital in 1946 and lived in East Dayton on Eastman Ave. between Spinning Road and Woodman until he headed off for Capital University in Columbus. He returned to the Dayton area in 1991 when he took the job as City Manager of Germantown. Ed doesn’t recall having found anything of great value as a kid. In fact, he says he doesn’t think he has found anything of great value since then either! Ed has found some old dump areas while out hunting mushrooms and just walking he has found a few medicine bottles, milk bottles, canning jars and the like. He can’t wait to get going on a privy dig! 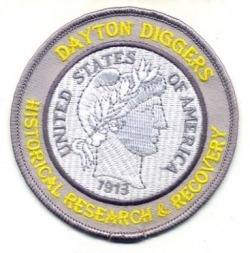 Ed says he’s never been a member of any organizations similar to the Diggers and just happened to learn about the Dayton Diggers by chance. Ed says, “I Googled the Roy Sigritz bottle that I had sitting around for a long time, and saw a comment about it by Dayton Digger. I then Googled Dayton Diggers, and as they say, the rest is history.” Steve Greene said that Ed also enjoys golf and that the Sigritz Hutchinson soda Ed brought to the last meeting was really great bottle. Ed received a Bounty Hunter Quick Draw II metal detector as a gift from his children when he retired. Ed says he hasn’t fully learned how to use it most effectively. He would like to go out with some of the other members to get their help and advice. Ed also wants to do some privy digging and old dump digging He says he’s holding off buying a good shovel until he see what works best.